A Thanksgiving Mass will be offered by the Rev. 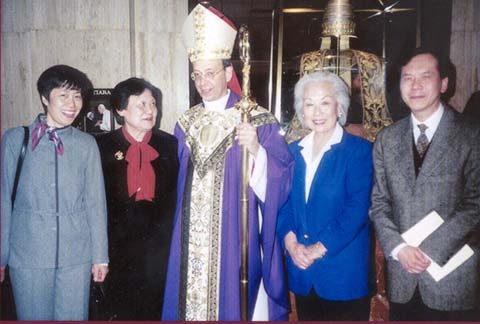 Walter R. Rossi, Director of Pilgrimages and liaison priest of the Our Lady of China Project, for the Chinese Catholics and friends on the first anniversary of the dedication of the Our Lady of China Mosaic. The Mass is scheduled at 3 p.m., August 3rd, 2003 in the Crypt church, Basilica of the National Shrine of the Immaculate Conception in Washington DC. All are welcome. 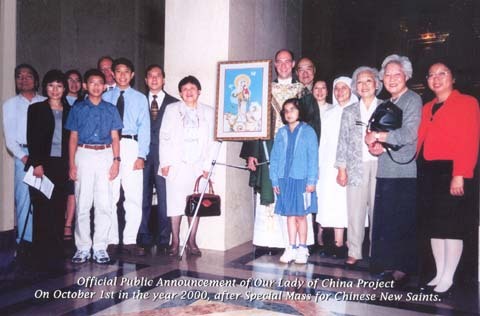 MARK YOUR CALENDAR: AUGUST 3, 2002 - DEDICATION OF OUR LADY OF CHINA MOSAIC AT THE BASILICA IN WASHINGTON DC. DETAILS TO FOLLOW. HOPE TO SEE YOU HERE. Click here for more details. Catholic San Francisco announced the Dedication of our Project in their April 12 issue. Sister Maria Hsu of the Office of Religious Ministries for the Archdiocese of San Francisco is organizing a contingent of local Chinese to be present at the dedication. She also encourages all to join on a special pilgrimage to the National Shrine (August 1-4), especially young people, “for whom it will be a very precious memory for them to keep.” she said. Arlington Catholic Herald released the dedication news by Catholic News Service in their March 7th issue. Reverend Msgr. Michael Bransfield announced the Dedication date as August 3 for Our Lady of China Mosaic in its biannual publication “Mary’s Shrine”, Volume 63, No. 1, Spring/Summer 2002. Our Lady of China Mosaic was installed on the Feast Day of Our Lady of Guadalupe. Mosaic Italian artisans arrive at the Shrine to install the Our Lady of China mosaic and a mosaic of Our Lady of La Salette. In gratitude for all of the Our Lady of China Project's generous donors, the project team created a scroll, listing the names of all donors. This scroll was placed in a crevice at the base of the mosaic and sealed for all time. The mosaic was laid over the crevice. Daisy Lin and Maria Yu attended the Shrine's annual Board of Trustees dinner at the Hyatt Regency Hotel (during the U.S. Conference of Catholic Bishops annual meeting). First week of November artisans began preparing the area of the west nave in the Shrine's Great Upper Church for installation of the mosaic. A metal box containing the donors' names was sealed into the wall. Letters to donors informed them that Father Rossi granted permission to place their names in sealed container permanently behind the mosaic. This honor was particularly pleasing to the committee because it is a perpetual remembrance of all those who supported the project. The letter also announced that Msgr. Bransfield approved our requested dedication date: August 3, 2002. The prayer to Our Lady of China: focused on our mosaic's theme "Faith, Hope, Love, and Unity" was approved. Hail, Holy Mary, Mother of Our Lord Jesus Christ, Mother of all nations and all people. Teach us, your way of total obedience to God's will. Stir up in our youth, an unconditional giving of self to the service of God. We call on your powerful intercession for peace, reconciliation and unity among the believers and conversion of the unbelievers in China and throughout the world, for God's mercy is our only hope. Our Lady of China, Mother of Jesus, hear our petitions and pray for us. Amen. Mosaic displayed at the Basilica of the National Shrine of the Immaculate Conception, Washington, D.C. U.S.A. Dedicated on 8/3/02. Daisy Lin and Maria Yu joined Msgr. Bransfield and Mr. Rugo in Venice, Italy and traveled to Spilimbergo to inspect the almost-completed mosaic. Msgr. Michael Bransfield, rector of the National Shrine, announced the Our Lady of China Project in the "Mary's Shrine" newsletter. Fund raising efforts took fu11 priority. We are grateful to all our Chinese brothers and sisters and their friends working endlessly for the success of the project. Fund raising reached 50% of its goal. Father Walter Rossi, associate rector of the Shrine and the project's liaison, gave approval for Mr. Brett Rugo, the project's general contractor to start fabricating the Our Lady of China mosaic. The Most Rev. Alex J. Brunett, Archbishop of Seattle, gave support to Our Lady of China Project at the request of his assistant for APA Affairs, Ms. Veronica Barber. In collaboration with Fr. James Elliott and the Chinese Catholic Community, efforts began to raise money for the mosaic image. Initial funds were raised at the May 12 APA gathering, and by the Chinese community at Our Lady of Mt. Virgin Parish in Seattle, but special Masses in parishes with Chinese Catholics were scheduled for August and September. Kathleen Muldoon of "Today's Catholic" in the Archdiocese of San Antonio introduced our project in the paper's April 20 edition. Peter Gill, editor of the Diocese of Norwich, Connecticut's "Four County Catholic," announced our project in the April 2001 issue. A letter went to all our donors and supporters informing them that the project has reached 45% of its fundraising goal. Father Anthony E. McGuire, with Migration and Refugee Services, Office for the Pastoral Care of Migrants and Refugees, reported on the project in the March issue of "The Networker." Also in March, the Our Lady of China Pastoral Mission in Washington, D.C. promoted the project in its monthly Chinese newsletter. Father Franklin M. McAfee, pastor of St. Catherine of Sienna Church in Great Falls, Va., announced the project in the March 4 and March 11 bulletin. Fred J. Turek, a Knight of Columbus, helped to raise funds for the project after St. Catherine's weekend Masses. Father Joseph Cheng, S.D.B., president of the Chinese Clergy, Religious, and Laity Association in North America, visited the Archdiocese of Washington and was introduced to our project. Father Cheng was enthusiastic and supportive. He concelebrated the noon Mass at the Basilica March 22, and the following day joined the procession of the cardinals, bishops and priests from throughout the United States and many parts of the world for the dedication Mass of the nearby Pope John Paul II Culture Center. A news release with personal letter was sent to all the U.S. Catholic papers announcing the Our Lady of China Project. Also on that date, Bishop William E. Lori, our Episcopal sponsor, was installed as the Bishop of Bridgeport (Connecticut). Daisy Lin, Carolyn Ng, and Maria Yu attended the installation Mass at Sacred Heart University in Fairfield, Conn.
Committee Members joined Archdiocese of Washington faithfuls to bid farewell to Bishop William E. Lori, the Project Bishop-Sponsor who was elevated to the Bishop of Bridgeport, Connecticut. Virtual Tour of the Basilica of the National Shrine of the Immaculate Conception. Committee members attended the Consortium Meeting of Diocesan Directors in Baltimore and introduced Our Lady of China Project. The official web site for the Project was set up, courtesy of FYI-For Your Information, Inc.
One third of the fund has been raised through the generosity of the Chinese American Catholics and their friends. The Project Committee released the first version of a 10-min. videotape with the approval of the Basilica. Produced by Mr. Carl Whichard, the tape promotes the Project in English and is translated into Chinese: Cantonese and Mandarin. Dr. Daisy Lin was invited to give a report of the Project to the Basilica's Board of Trustees at the Annual Bishop's Conference in Washington, DC. The Project Committee sent a mass mailing of brochures and flyers to the pastors of the Metropolitan DC area, and to more than 60 contact persons of various Chinese churches and organizations across the country. 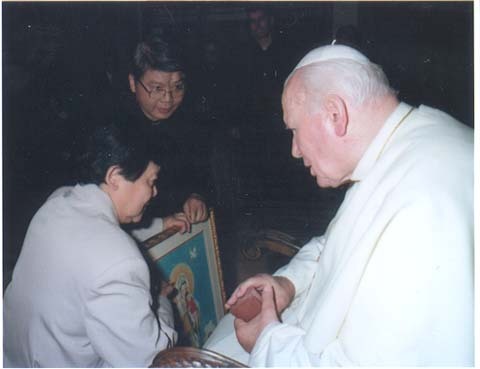 The Project and the artwork were blessed by the Holy Father during Dr. Daisy Lin’s private audience with His Holiness. Rev. Walter Rossi offered a Mass of Thanksgiving at the Basilica to coincide with the canonization of the Chinese martyrs in Rome. Our Lady of China picture was on display after Mass. Public fund raising started in the Archdioceses of Washington DC, Philadelphia, New York, Newark, and San Francisco. The Project brochure became available for distribution. The Committee selected Rugo and Crossi, LLC, Nature Stone and Mosaic Contractors in Woodbridge, VA, for the Project. Rev. Father Thomas Betz of the Holy Redeemer Chinese Catholic Church and School in Philadelphia announced the Project in their August Holy Redeemer News; a special collection was held for the purpose. Sister Janet Carroll, M.M. Editor of the China Church Quarterly, United States Catholic China Bureau, published our flyer "A Legacy to Our Lady" announcing the Project. The Project Committee sent letters, Shrine brochures, and flyers to all the Chinese religious in the United States, different directors in charge of Chinese/ethnic apostolates, and the Chinese church organizations that were made known to the Committee. The Project committee contacted all the Archbishops and Bishops of the United States for permissions to contact the Chinese American Catholics in their respective archdioceses/dioceses. The Iconography Committee of the Basilica approved the Project as presented by the Committee for the Promotion of Our Lady of China Project. The Most Reverend William E. Lori, then auxiliary bishop of the Archdiocese of Washington, now Bishop of Bridgeport, Connecticut, consented to be the Bishop-Sponsor of the Project. Rev. Robert Hill, Secretary for Services for Religious Men and Secular Institutes in the Archdiocese of Washington DC, graciously agreed to be the liaison. Msgr. Michael J. Bransfield, Rector of the Basilica, showed an available space, on the west side of the nave in the Great Upper Church, on the wall above the center stairwell to the members of the Committee for the Promotion of Our Lady of China Project. He also delegated Rev. Walter R. Rossi, Associate Rector and Director of Pilgrimages as the liaison.